Coming at you: the radiant of the Orionid meteor shower is in the constellation of Orion, the Hunter. You can find the constellation easily overhead in the predawn sky. 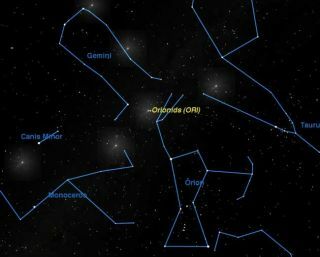 Look for three close stars of Orion's belt, and three more that hang below as his sword. Then find the bright stars that represent his shoulders. The meteor shower's point of origin, or radiant, is noted. But shooting stars could show up anywhere in the sky. The Orionid meteor shower is expected to put on a good show tonight into the predawn hours Wednesday, weather permitting. This annual meteor shower is created when Earth passes through trails of comet debris left in space long ago by Halley's Comet. The "shooting stars" develop when bits typically no larger than a pea , and mostly sand-grain-sized, vaporize in Earth's upper atmosphere. "Flakes of comet dust hitting the atmosphere should give us dozens of meteors per hour," said Bill Cooke of NASA's Meteoroid Environment Office. People in cities and suburbs will see far fewer meteors, because all but the brightest of them will be overpowered by light pollution. The best view will be from rural areas (the moon will not be a factor, so dark skies will make for ideal viewing). The best time to watch will be between 1 a.m. and dawn local time Wednesday morning, regardless of your location. That's when the patch of Earth you are standing on is barreling headlong into space on Earth's orbital track, and meteors get scooped up like bugs on a windshield. Peak activity, when Earth wades into the densest part of the debris, is expected around 6 a.m. ET (3 a.m. PT). Some meteors could show up late tonight, too. Late-night viewing typically offers fewer meteors, however, because your patch of Earth is positioned akin to the back window of the speeding car. The Orionids have been strong in recent years. "Since 2006, the Orionids have been one of the best showers of the year, with counts of 60 or more meteors per hour," Cooke said. Some of those counts come in flurries, so skywatchers should find a comfortable spot with as wide a view of the sky as possible. Lie back and allow 15 minutes for your eyes to adjust to the darkness, then give the show at least a half hour to play out through spurts and lulls. Meteors could appear anywhere in the sky, though traced back they will appear to emanate from the constellation Orion. Telescopes and binoculars are of no use, because meteors move too quickly. Extra warm clothing is a must, and a blanket and pillow or lounge chair allows comfortable positioning so you can look up for long stretches. Predicting meteor showers is tricky because the debris comes from multiple streams. Each time comet Halley passes around the sun on its elongated orbit – every 76 years – it lays down a fresh track of debris for Earth to plow through in subsequent years. Those tracks spread out and mingle over time, and we pass the tracks each October during our 365-day, nearly circular trek around the sun. Japanese researchers Mikiya Sato and Jun-ichi Watanabe say activity in recent years is related to debris put in place from 1266 BC to 911 BC, and this could be another good year, according to NASA. Even if that prediction does not hold, the Orionids will almost surely put on a decent show. Prior to 2006 and going back many years, the Orionids have produced a reliable 15 to 20 meteors per hour at the peak, for skywatchers with dark skies. As a bonus, this time of year you can expect an additional five to 10 sporadic meteors per hour – those not related to the shower.